The 2018 Lure Makers Challenge in Kona, Hawaii was a rousing success. Jody Bright’s Tropidilla Productions 3 day tournament paid out over $100,000 in prize money to the top 5 teams. Tantrum Lures, winner of the 2017 Lure Makers Challenge, sponsored this year’s tournament. Competition was fierce among 18 teams. Adding to the adventure and excitement, fishing along the Kona coast was great all summer. 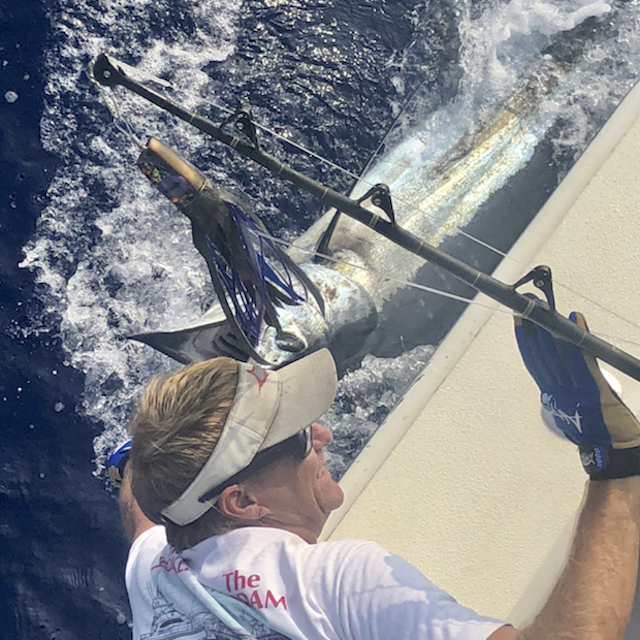 At the end of the final day of fishing, big game lures fashioned by more than two dozen lure makes recorded 55 Pacific Blue Marlin captured or released. In addition, the teams boated 8 ahi, including Capt. 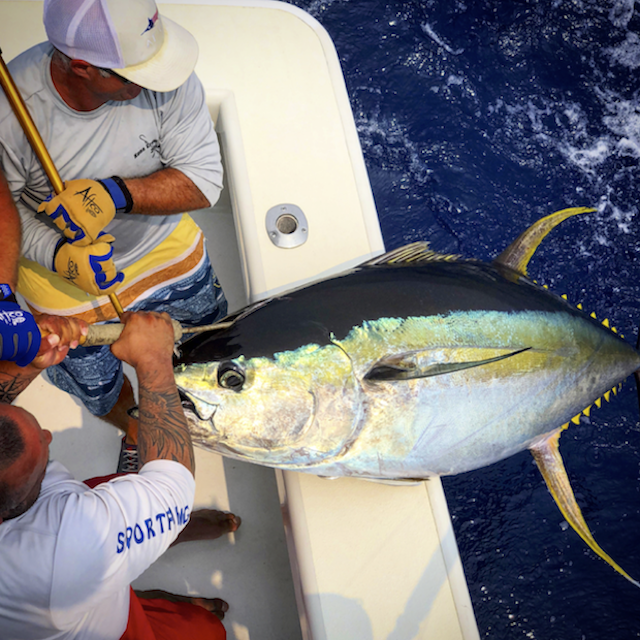 Shawn Rotella’s 205 pound fish, the largest yellow fin tuna caught in a tournament all summer. As a result of the non-stop action, competition was hot and heavy all three days. Finally, when the water settled and the tagging, landing, jumping and releasing were over, Captain Carlton Taniyama and his team aboard Five Star walked away with $88,380 in prize money. But this competition is about more than who caught what. It’s about which lure maker’s creations tempt the most fish to the transom. The undisputed champion lure maker in Kona for 2018 is Eric Koyanagi of Koya Lures. Way to go, Eric! Captain Taniyama of “Five Star” took the lead almost from the beginning on day one. Anglers Mike Paris and Mike Shimamoto earned 600 points. Carlton Taniyama pointed Five Star south to an area called “Victor,” near the fishing village of Milolii. By 8:14AM they raised the first of their three Pacific Blue Marlin for the day and earned a day 1 total of 600 points. Although competition was fierce, Five Star took the lead early and held it throughout the competition. Day 2 again found the team fishing Victor. Five Star anglers Paris and Shimamoto racked up another 800 points. Mike Paris’s day 3 Pacific Blue Marlin clinched Five Star’s tournament winning total of 1600 points. Five Star’s hot lures included a Koya 9” bullet skirted in rubber octopus skirts. A large ice blue Koya tube skirted in blue vinyl and a large Koya Poi Dog with a black top also skirted in vinyl rounded out Five Star’s lucky spread. Captain Shawn Rotella, skipper of “Miss Mojo”, took a close second place in the Lure Maker’s Challenge with 1301.5 points. As luck would have it, anglers Ray Rubalcava, Victor Rubalcava, and Curtis Gibson lost two 500 lb. Pacific Blue Marlin or the point standings would have been very different. A purple and black Moke bullet (Tsutomu 9” Bullet) on the long rigger was Miss Mojo’s most productive lure. In addition Capt. Rotella ran a 14” Tanigawa plunger with a green top on the short corner. Captain Shawn skirted the green top plunger in black vinyl. Without a doubt, the green and black combo tempted multiple marlin and ahi in for strikes. Captain Lance Gelman of the “Medusa” guided anglers Spencer, Brett and Ensin Johns to 3rd place in the Lure Makers Challenge. The Medusa team racked up 800 points with 4 Pacific Blue Marlin catches and took home $2,646. The estimated weight of their big game fish was 110, 125, 140 and 140 pounds. “Rod Bender”, piloted by Captain Kerwin Masunaga, took 4th place in the tournament. Angler Heather Masunaga caught a Pacific Blue Marlin and an Ahi on Kona Custom Lures. The 4th place purse earned the team $2,520. Captain Chris Choy aboard “Sapo” with Angler Edgar Articona ran both Geelo Lures and Koya Lures in his lure pattern. Providing proof to the pudding, Captain Choy’s Koya 614 was hit more than any other lure in Sapo’s spread. Sapo took home $1,080 for their 5th place finish. Koya Lures and Five Star are the big winners of the 2018 Lure Maker’s Challenge. Congratulations to Captain, crew, anglers and, of course, Eric “Koya” Koyanagi for his fish catching bullets, 614s, Poi Dogs, tubes and more. Well done! A beautifully presented history and encyclopedia of Joe’s work. This is a “coffee table style” art book, measuring 9¼” X 12¼” with glossy, heavy weight pages that provide a high quality backdrop for the full-color imagery. You will find hundreds of photographs and the lure descriptions, and identification assistance for the collector. In addition there are anecdotes and quips from Joe himself, to provide the Yee Lure aficionado with hours of enjoyable reading and conversation among friends. Case-bound in hard cover, with a tasteful gold trim created by the gilt edged pages, this book will add a sophisticated touch to any sport fisherman or lure collector’s home.